Brainwave Studio is an universal application that suits people who undergoes stressful situations at work, has trouble falling asleep or wants to meditate. With a broad selection of available sessions every user will be able to achieve a desired state of mind. Brainwave Studio has 40 unique sessions, each is specifically designed to suite ones needs. No matter if you are looking for a lunch breake relax or a deep stress relief this application has you covered. To make the sessions more personal app users can choose from 28 background sounds which include thunder, crickets, birds and many other. Users can custom mix sounds and adjust the volume of each individual sound. Every relaxation session starts with a predefined music track which can be changed to any of 12 available different melodies. The standard way of using this application is to simply choose one of 5 categories and then click on one of the available sessions. You can choose from 5 categories (relaxation, stress and anxiety, sleep, meditation, mind training). Each category has 6 or more sessions. To make the sessions more personal you can choose from 28 soothing background sounds, these sounds have separate volume controls and you will be able to mix them together. Every session comes with a predefined music track which can be changed to any of 12 available high quality melodies. 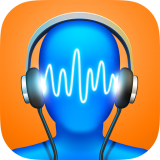 Brainwave Studio is an universal application – you can listen only to background sounds or you can choose to listen only to the available melodies.